A plant grower from Denbighshire has helped grow what is believed to be the world's hottest chilli pepper. 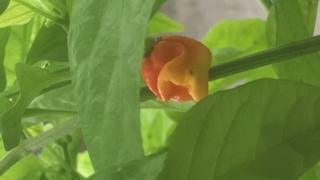 Mike Smith from St Asaph has been growing the Dragon's Breath chilli, which belongs to Nottinghamshire chilli farmer Neal Price. It has a Scoville scale rating of 2.4 million units of heat, compared to 1.5 million of the current record holder. The chilli will be exhibited at the Chelsea Flower Show next week. Mr Smith, who has been growing plants for about eight years, said the chilli's heat was "beyond" and has the potential to be used as an alternative to anaesthetic in third world countries. Would you dare eat a mega-hot chilli? Mr Smith was loaned the chilli plant by Mr Price about three months ago, who grew it using a new plant food developed with Nottingham Trent University. He has not tasted the chilli as he said "it would not be a pleasant sensation," but Mr Price has. He said it had an "initial fruity flavour" and is then "extremely hot for about half an hour". Mr Smith suggested the chilli could be used an alternative to anaesthetic in third world countries - which do not have access to or the money for the drug - as the oil from it is capable of numbing the skin. It could also be useful on people who are allergic to anaesthetic. An application to Guinness World Records is currently awaiting confirmation that the chilli is the world's hottest. The current record is held by The PuckerButt Pepper Company in the US for its Smokin Ed's Carolina Reaper, which rates at an average of 1,569,300 Scoville heat units.